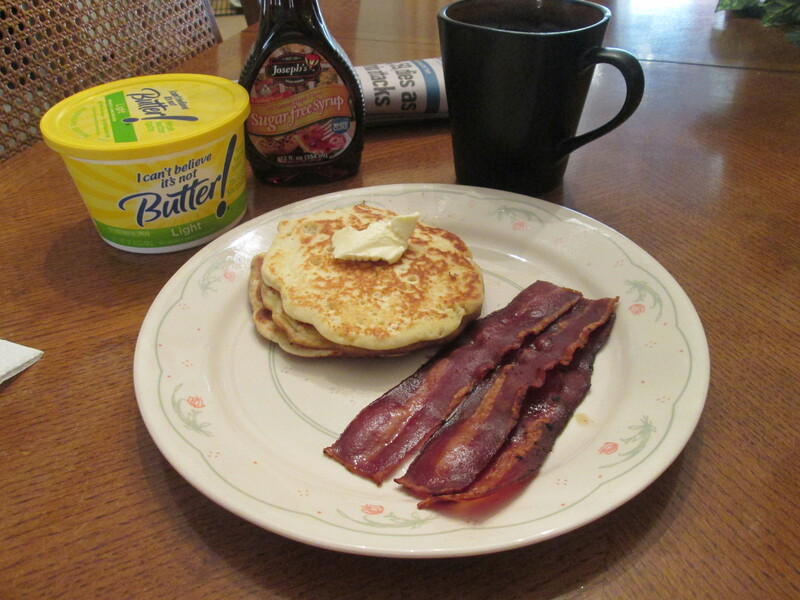 Pancakes and Turkey Bacon this Morning! It has been way, way, too long since I’ve had some Pancakes! 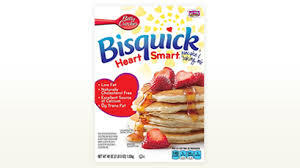 The other day I bought a box of Bisquick Heart Smart. It’s a Low Fat and 0 Cholesterol pancake mix. There are 190 calories and 32 net carbs per serving, 3 Pancakes per serving. I used Egg Beater’s instead of 1 Egg to prepare the mix with. 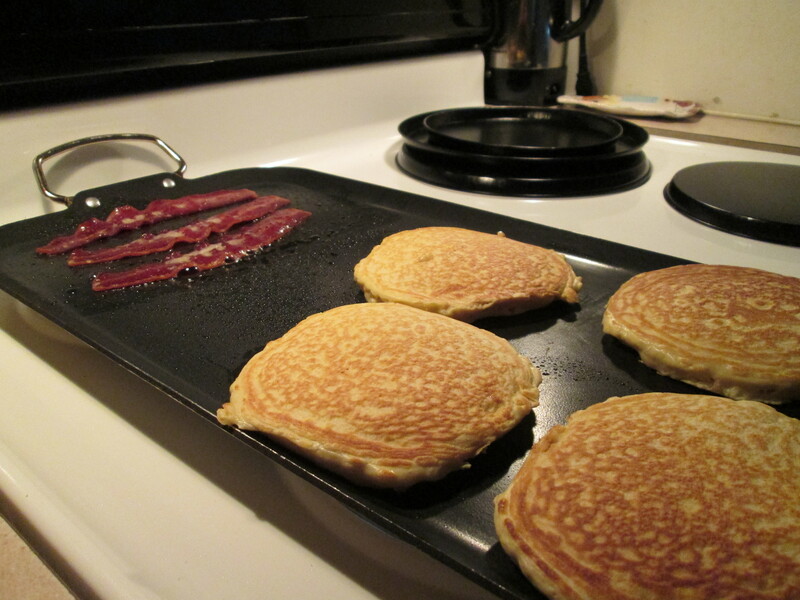 I used my flat top griddle to cook them on, along with my Jennie – O Turkey Bacon. For the Pancakes I topped them with I Can’t Believe It’s Not Butter and Joseph’s Maple Sugar Free Syrup. The pancakes came out nice and fluffy, they hit the spot! And if you have Diabetes 2, like myself, you have to try this Joseph’s Sugar Free Maple Syrup! No difference in taste from regular Syrup and it’s only 35 calories, 0 fat, and 9 carbs per serving. Everything hit the spot, It won’t be so long in between Pancakes! Prepare tasty dinners, desserts, breakfasts and more with Bisquick Heart Smart Pancake and Baking Mix. This pancake baking mix is low in fat, cholesterol-free and is an excellent source of calcium. It delivers a smooth and fluffy texture along with a delicious taste to pancakes, muffins, pot pies, cakes and many other dishes. This Bisquick baking mix is a classic and convenient ingredient you can count on for tasty and easy-to-prepare dishes. Our Turkey Bacon is a delicious alternative to pork bacon. Preheat a nonstick skillet or electric griddle over medium heat (375°F). Heat slices for 6-7 minutes or until desired crispness, turning frequently. 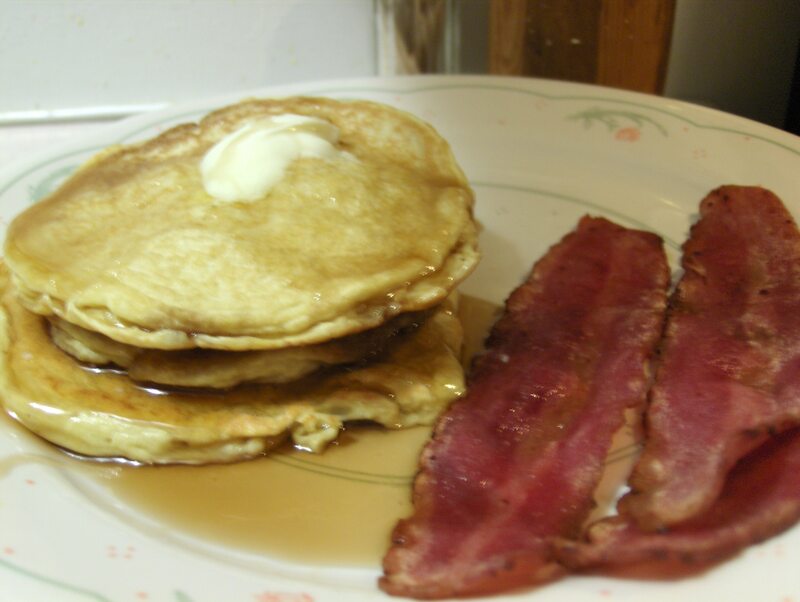 For crispier bacon; Lightly spray skillet with nonstick cooking spray before heating bacon. It’s about 6:45 am and not a creature is stirring, but ME! I go out and get the Saturday papers, and it’s a beautiful morning! A beautiful morning deserves a great Breakfast start. So I heated up the flat griddle and mixed up some Pancake Batter. I always use New Hope Mills Pancake Mix. It makes some nice and fluffy Pancakes while they are only 200 calories and 6 carbs per serving (4 Pancakes). I only had 2 of them and saved the other 2 for Mom. So my calorie count was only 100 and carbs 3! You can’t beat that and throw in how good they are. 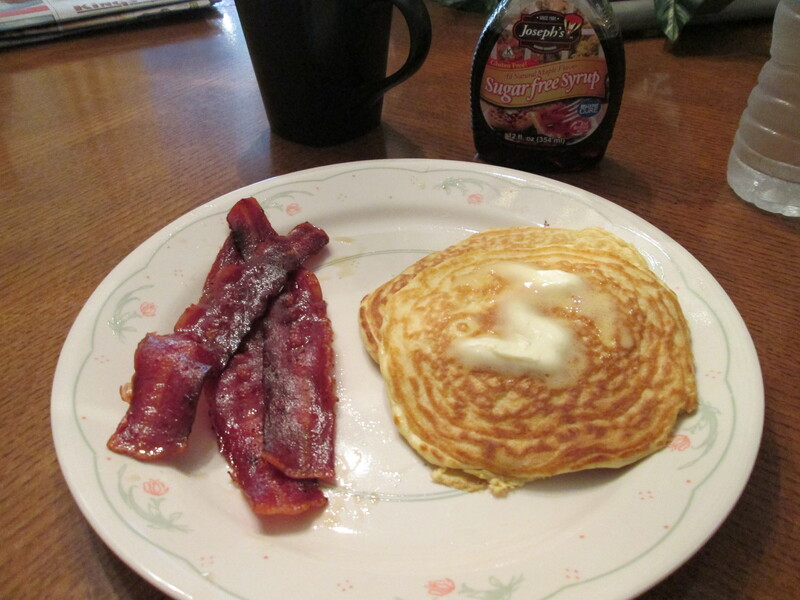 I used Joesph’s Sugarless Maple Flavored Syrup, 35 calories and 9 carbs. Another great one when your watching the calories and carbs, I only used a 1/2 a serving of this also. I then topped it with I Can’t Believe It’s Not Butter. 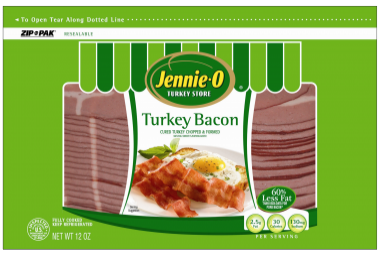 For the Bacon I used one I had never tried until earlier this week, Jennie – O Turkey Bacon. I really prefer this over what I had been using. The taste is better, fries up crisper, and is 15 less calories for 3 slices! 3 slices are 90 calories and 0 carbs. I’ve got the dishes done, another advantage of using the griddle 1 pan to clean, the paper read, and the hot Bigelow Decaf Green Tea drank. I’m ready to get out and enjoy this beautiful day! It Was Early Morning Yesterday I Was Up Before The Dawn! Rocking to some classic Super Tramp this morning while making breakfast. I’m not sure if it was my attempts at singing or the smell of crisp Turkey Bacon frying that woke everyone up this morning! I started my day off with a delicious, healthy, and low carb breakfast. 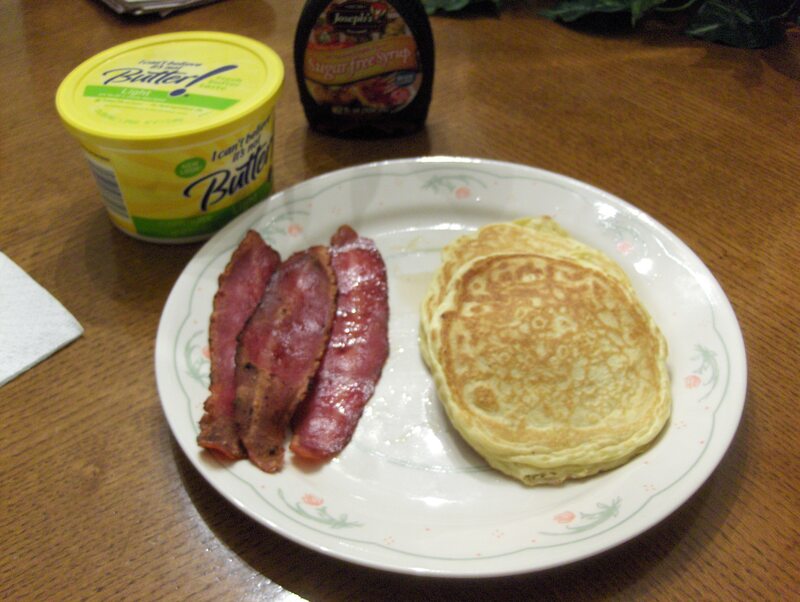 I made Pancakes using New Hope Mills Pancake Mix, only 200 calories and 6 carbs per serving. A serving is a 1/2 cup of pancake mix which you can make into 3 – 4 pancakes. I topped it with I Can’t Believe It’s Not Butter and Joseph’s Sugar Free Maple Flavored Syrup. The Syrup is 35 calories and 9 carbs per serving, a serving is 1/4 cup. I had a side of 3 strips of Oscar Mayer Low Sodium Turkey Bacon which is 35 calories per slice. A great and healthy way to start the day! It had been too long since I had Pancakes. So this morning was the morning to get the griddle out and flip those cakes! Having Diabetes 2 regular Pancakes are a little high in carbs especially when you add the Maple Syrup. So after sampling and tasting different brands I settled on New Hope Mills Pancake and Waffle Mix along with Joseph’s Sugar Free Maple Flavored Syrup. The Pancakes are only 200 calories and 6 carbs (3 net carbs) for 4 Pancakes! The Joseph’s Syrup is 35 calories and 9 carbs per serving (1/4 cup), which I never use a full serving. I also had 3 pieces of Oscar Mayer Turkey Bacon which is only 35 calories and 0 carbs. Diabetes or not you can still have a great tasting and filling breakfast. Having been diagnosed with diabetes, it’s been difficult to find something to eat for breakfast that won’t shoot my blood sugar through the roof. I then found New Hope Mills Pancake Mix! Hot, fluffy pancakes and crispy waffles without loads of carbs. Love pancakes and waffles drenched in syrup but hate the idea of all that refined flour and sugar? Then New Hope Mills Pancake and Waffle Mix is for you. They use wheat gluten and a low glycemic cornstarch which are much higher in protein and lower in carbs than traditional flour. So, go ahead, enjoy your pancakes and waffles. You’ll be doing your body and your taste buds a favor. Ingredients: Wheat Gluten, Cornstarch, Milk Protein, (Casein Protein, Whey Protein), Leavening (Baking Soda, Sodium Aluminum Phosphate, Monocalcium Phosphate) Natural & Artificial Flavor, Sucralose.